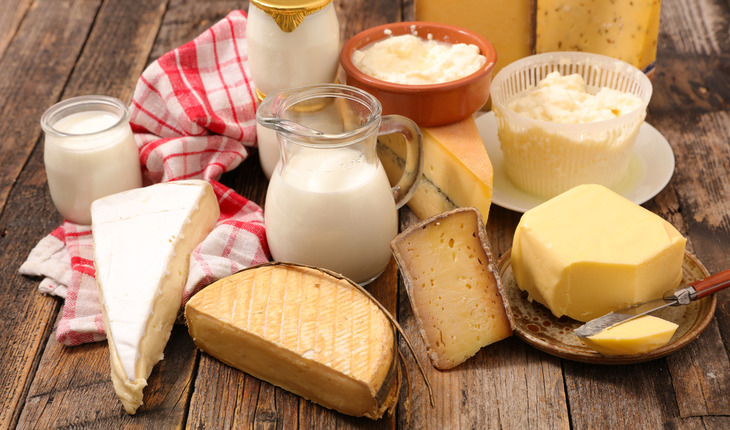 Research published in 2017 by scientists at the Jean Mayer USDA Human Nutrition Research Center on Aging (USDA HNRCA) at Tufts University in Boston shed new light on vitamin K and its significant presence in some dairy products available in the United States. A release from the university reports that in the study, which appeared June 1st in Current Developments in Nutrition, researchers quantified the activity of two natural forms of vitamin K in dairy products of various fat contents and found that common U.S. dairy items including milks, yogurts and cheeses, contain appreciable amounts of multiple forms of vitamin K. Vitamin concentrations varied by fat content. Vitamin K, which helps the blood to clot, is most commonly thought to come from leafy greens such as spinach, kale and broccoli. In fact, dietary sources of vitamin K are found in two natural forms: phylloquinone (PK, or vitamin K1), which is widely distributed through plant-based foods, and menaquinones (MK, or vitamin K2), which appear to be primarily in animal products and fermented foods. Almost all MK forms are also produced by bacteria in the human gut. Not much is known about MK amounts in U.S. dairy products. Guidelines for adequate vitamin K intake are based only on PK intake without consideration for other forms of vitamin K. MK differ from PK in structure in that they are compounds with different numbers of isoprenoid units in the side chain, designated as MK4 through MK13. Which forms of MK are present reflects which bacteria might be in the dairy products. Lactic acid bacteria, for example, are widely used in dairy and fermented foods. To understand the presence of MK and PK in dairy products, the researchers used 50 nationally collected dairy samples provided by the USDA Nutrient Data Laboratory and 148 dairy samples purchased in 2016 from Boston area retail outlets. The products were divided into categories based on dairy types and fat content: milks, yogurts, Greek yogurts, kefirs, creams, processed cheeses, fresh cheeses, blue cheeses, soft cheeses, semi-soft cheeses, and hard cheeses. The effect of fat content on total vitamin K in all forms was compared using a two-sample T-test. The vitamin K content of cream products, for which the researchers had a smaller sample size, was analyzed using a general linear model, with heavy cream as the reference group. All full-fat dairy products contained appreciable amounts of MK, primarily in the forms of MK9, MK10 and MK11. Combined, these three forms of MK accounted for approximately 90 percent of total vitamin K present in the foods tested. In cheeses, the total vitamin K content varied by type, with soft cheese having the highest concentration, followed by blue cheese, semi-soft cheese, and hard cheese. All of the cheeses contained MK9, MK10 and MK11, and modest amounts of PK, MK4, MK7, MK8 and MK12. Little MK5, MK6 or MK13 was measured in the majority of cheeses. In milk, the vitamin K concentrations varied by fat content; both total vitamin K and individual MK concentrations in full-fat milk were significantly higher than in 2 percent milk. PK was only detected in full-fat milk. Only MK9-11 were detected in milk. In yogurts, full-fat regular and Greek yogurts exhibited similar vitamin K concentrations as in full-fat milk; neither MK nor PK were detected in fat-free yogurt. “Estimated intakes of PK and MK in dairy-producing countries in Western Europe suggest that between 10 and 25 percent of total vitamin K intake are provided by MK, and primarily from dairy sources. Additionally, observational data from Europe suggest that MK from dairy products have a stronger association with heart health benefits compared with PK intakes. This data from other countries highlights the need to analyze MK in commonly consumed foods in the U.S.,” said Sarah L. Booth, Ph.D., last author on the study. Booth is senior scientist and director of the Vitamin K Laboratory at the USDA HNRCA, interim director of the USDA HNRCA, and professor at the Friedman School of Nutrition Science and Policy at Tufts University. Additional research is needed to determine the role of microbes used in production of dairy products, and their impact on MK content. The researchers also say there is a need to determine the relative bioavailability of all MK forms given their abundance in the U.S. diet. The researchers acknowledge limitations of the study, including the reliance on food labels for fat content instead of direct measurement of fat content. Additionally, whereas the dairy product samples obtained from the USDA Nutrient Data Laboratory were geographically representative of the U.S. diet, those purchased in the Boston region were not. However, items purchased locally were selected from retail outlets with national representation. Additional authors on this study are Stephanie G. Harshman and Xiaohua Shen, Ph.D., Jean Mayer USDA Human Nutrition Research Center on Aging at Tufts University; David B. Haytowitz, Ph.D., Beltsville Human Nutrition Research Center, U.S. Department of Agriculture’s Agricultural Research Service; J. Philip Karl, Ph.D., alumnus of the Friedman School of Nutrition Science and Policy at Tufts University and formerly of the Jean Mayer USDA Human Nutrition Research Center on Aging, now at the U.S. Army Research Institute of Environmental Medicine; and Benjamin E. Wolfe, Ph.D., department of biology, School of Arts and Sciences at Tufts University. This work was supported by the U.S. Department of Agriculture’s Agricultural Research Service and the National Dairy Council.